Nearby metro access is located at Mount Vernon Square / 7th Street / Convention Center off the Yellow and Green line. We are located 2.5 blocks south on 7th & K St.
You may also access the restaurant off of the Red, Yellow, and Green lines by using the Gallery Place / Chinatown exit. The food was fantastic. But what made the meal stand out was our waiter. I wish I could remember his name to give him credit. He was super friendly, extremely knowledgeable and professional to a fault. I was there a few weeks ago. The maitre’de remembered me and where I was sitting! You cannot beat customer service. The food is wonderful, very tasty and very filling. The Chocolate Budino is a must. Will be returning very soon. Had a phenomenal meal here recently - there were 3 of us. 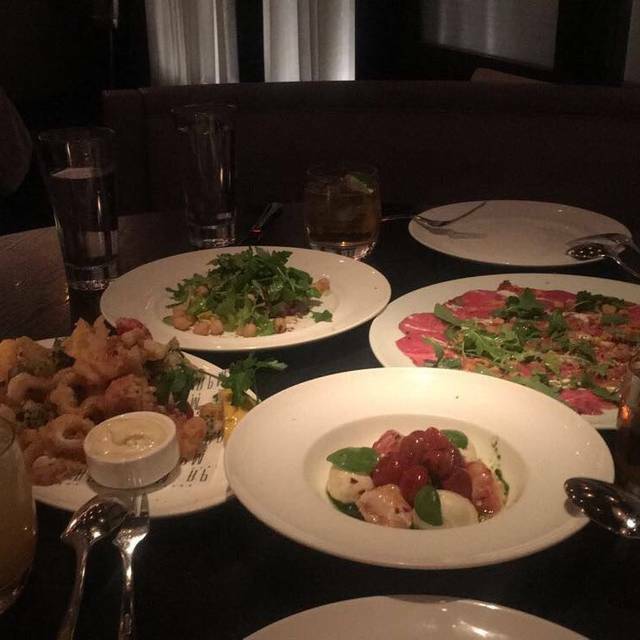 The food was outstanding - we shared three different appetizers: The artichokes and beef carpaccio from the menu - both of which were delightful - some of the best we have had. We also had a stuffed squash blossom appetizer special - yum! For dinner we shared a large steak and two sides - mashed potato and broccolini - the steak was cooked to perfection for all - even though 2 of us wanted medium rare and one had it well done - they were able to accommodate that unusual request. I would however, fault our main waiter on their lack of attentiveness. Once we ordered - other than pouring our wine once or twice and dropping off a dessert menu, which he never came back to inquire about, we had to flag him down several times. I also think the atmosphere is a little noisy for my taste - I would not recommend it for an intimate dinner - but if you want a superb meal - go! What a fabulous restaurant! My sister and I arrive much earlier than our reservations, but they were very accommodating in seating us earlier. Very attentive staff except when it started getting busier our water fill ups were forgotten. Excellent gluten free menu since I have Celiac's disease and my sister is gluten intolerant. They have a truly dedicated and separate gluten free menu. For starters we shared grilled oysters which were delicious. But, I must give a shake of our head. These oysters were discounted for happy hour, but "oh, no" not while we sat in the restaurant. We had to go into the bar to have the same oysters for $4.00 less. Tsk tsk on your customer service regarding this behavior even after speaking with the manager. Tsk tsk. We shared the lobster caprese salad and Cesear wedge salad. Delicious! The homemade gluten free fettuccine with bolognese sauce was out of this world! Had to ask for fresh grated cheese and no one came around for the pepper on our salads. Double tsk tsk. Had to save room for desserts which we shared the strawberry gelato with toasted pistachios and panna cotta with fruit. Both refreshing. We will definitely return and other family and friends are excited especially with homemade gluten free pasta! If only it could have been fresh homemade gluten free pappardelle, then it would have been perfezionare! Loved the creativity of this Italian food! 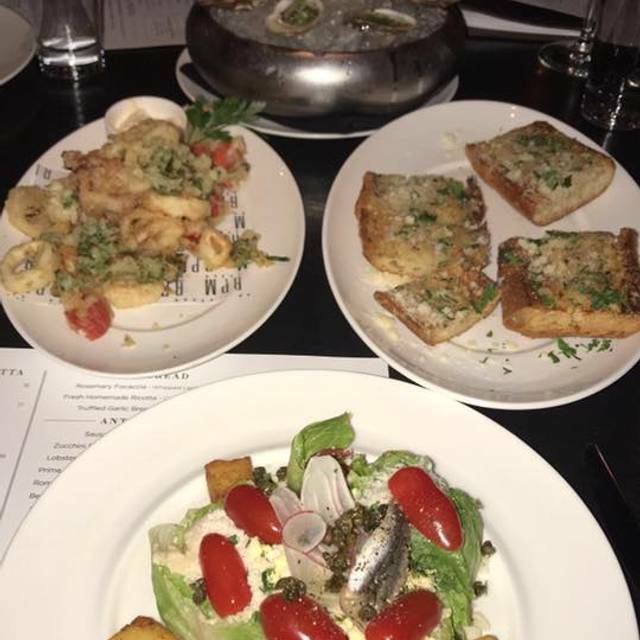 Started with a couple of delicious appetizers- the Mediterranean Octopus, The Cremini Mushroom Pizza, the Truffle Garlic Bread and the Shredded Brussels Sprout Salad. 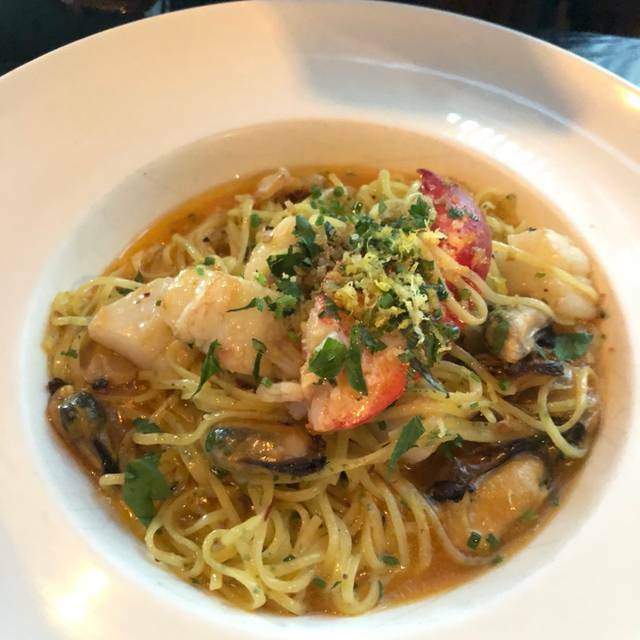 Our table of 4 then went on to share 2 pastas...one that a friend recommended which I don't usually order as not one of my favorite pastas but this dish changed my mind! The Pappardelle Bolognese was fantastic! We all totally agreed. We also tried the Spring Pea Taglietelle which was nice but needed something else to pop it. The meal ended with a bang! 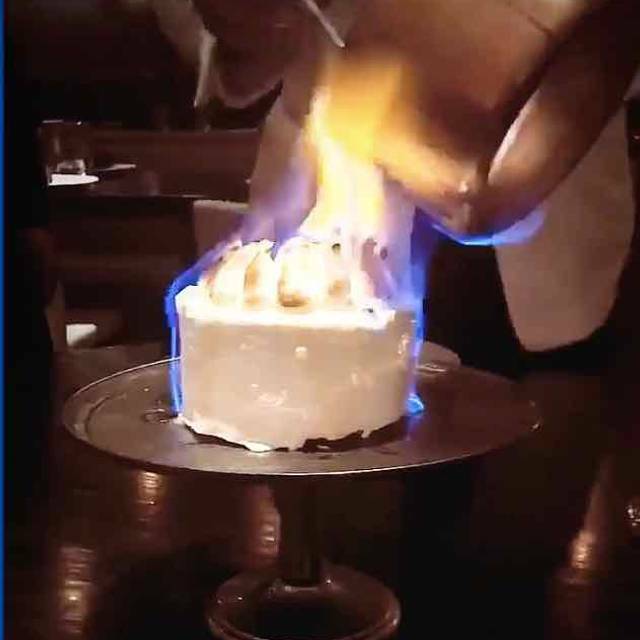 The Torta Meringata..the signature salted caramel & vanilla gelato cake which is flambeed at the tableside with chocolate fudge cascading down the sides....so fantastic!!! Our server, Soo, was phenomenal and truly made the evening memorable. From Giuliana Prosecco, straight through to Cappucino and a fabulous hazelnut dessert, the experience was delicious and truly unforgettable. Thank you for a fabulous night, a warm welcome, incredible food, and VIP service . We can’t wait to return! As a visitor from out of town I was looking for something special and somewhat local. RPM Italian fit the bill nicely. Great food, great service, and lots of elegantly dressed clientele (with a few Washington Caps playoffs fans, too). First time here and definitely coming back! Food was really tasty, great variety on the menu. Pretty lively/noisy so just pretend you’re at a table at a club and enjoy it! So great! Lots of good food and great service. Despite our reservation being at 8, they didn’t seat us until 8:20 and didn’t even apologize. The fried artichokes and chicken piccata were superb. The black and white motif for the room is attractive. One of the diners at our table feels linen table cloths would be more appropriate than bare wood. For $18, RP)M could be more generous with the size of its martinis. Luxurious and delicious. A little noisy for the older crowd but the focus on taste eclipses it. Excellent food in a restaurant that is a bit to reminiscent of a club for my taste. 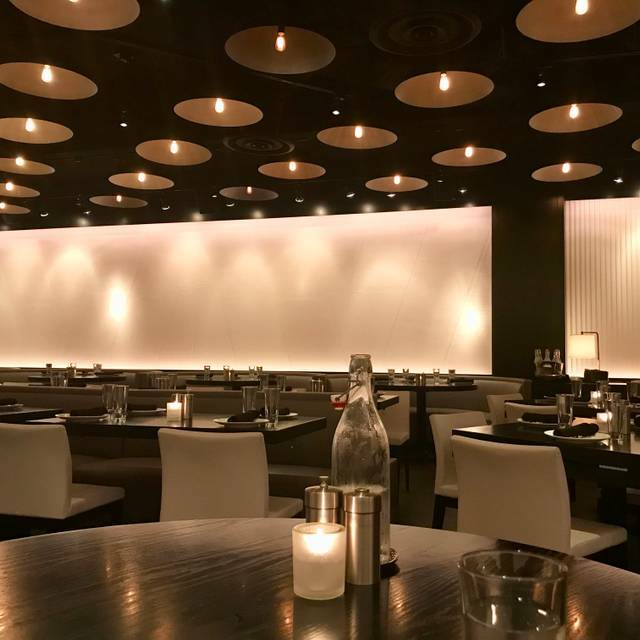 That being said, the strong aesthetic transports you from sleepy downtown DC to somewhere decidedly more interesting, making it a good spot for a date (our occasion), a business meal, or a night out with friends. Amazing service! A little disappointed in the food! I love this place! 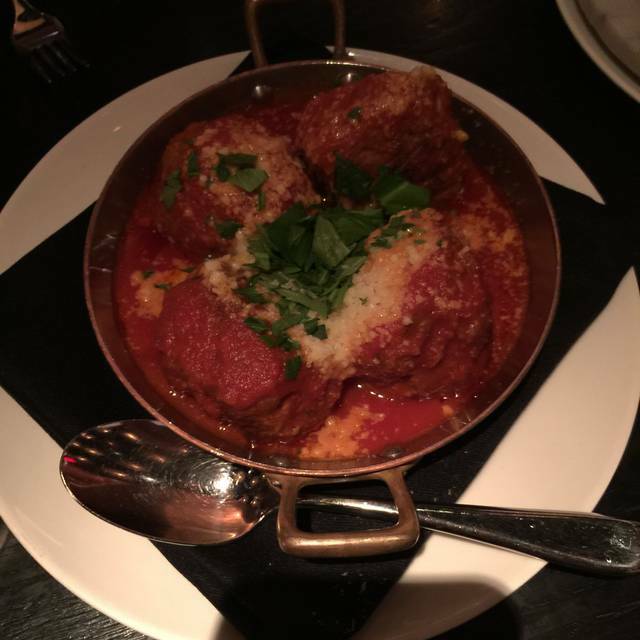 Best italian food in DC! Recommend this place to anyone. Great place, fantastic. Very good food. A bit pricey. Very good service and food, a little overpriced; good Italian wine selection. They've changed the lunch menu a bit. I prefer the previous fish option. I recommend rpm Italian to everyone . I had salmon this time around. It was very delicious and paired with pistachio. As always friendly staff and great service. I hope they get better service. Extremely disappointed in the service. My server disappeared after handing me the menu & found out I was a solo diner. Saw him chatting with another staff member. Had to get his attention to place my order. He misstated one of the entree specials, did not know the components of the cocktails. I could tell he was making them up as he tried to answer my questions so I had to ask another passing server. When that drink eventually arrived it was the best part of the meal- cheers to the bartender! Food was well prepared, nothing special. Absolutely amazing food!!! My girlfriends and I had an awesome time and looking definitely to go back!!!! Fabulous food. Favorite restaurant in DC! Our waiter Hayward was very good. We went for my birthday celebrate and they forgot to bring out the champagne that my sister had pre-ordered for our table. Been to the one in Chicago. Love the DC site just as well. One of the best restaurant meals I have eaten in a long time. Sea bass cooker to perfection; prawns a table favorite. Went for an early dinner before attending a show at the Warner Theatre. It was my first time at RPM. The decor is beautiful. But, most importantly, the food was superb. 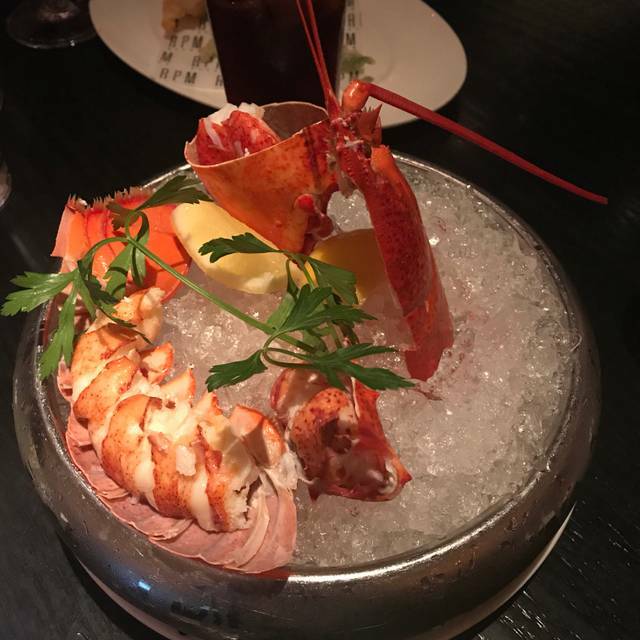 I had the chilled half lobster appetizer which was presented very nicely. It came with three different dippings - melted butter, wasabi, and some red sauce with horseradish. All three were tasty. The chicken piccata with spinach was a huge portion, half would have been sufficient. Since I was going directly to the theatre, I could not take the remains with me, unfortunately. The malbec wine was delicious. I was surprised to get a vodka martini served in a champagne glass. Maybe things are done differently in DC. No matter. It was still consumed. Service is attentive but not overbearing. Love this place. Service and food are exceptional!! Everything we had was excellent! All pastas we’re homemade. A little pricy, but it’s in the middle of D.C., five minute walk from the Marriott Marquis. This was by far the best restaurant I have been to in DC. Every dish was outstanding. We ordered four vegetables as appetizers which were unbelievably tasty. The pasta was so fresh and all four of us loved our main course. 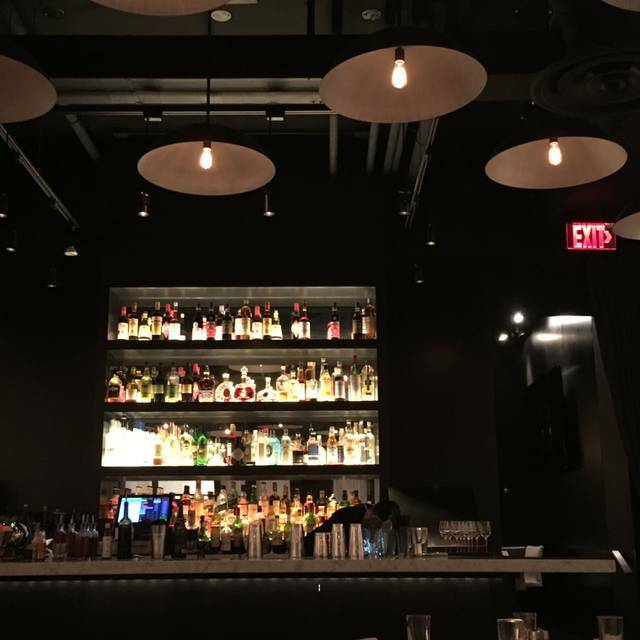 We have been to so many DC restaurants and I never write reviews but RPM was spectacular. 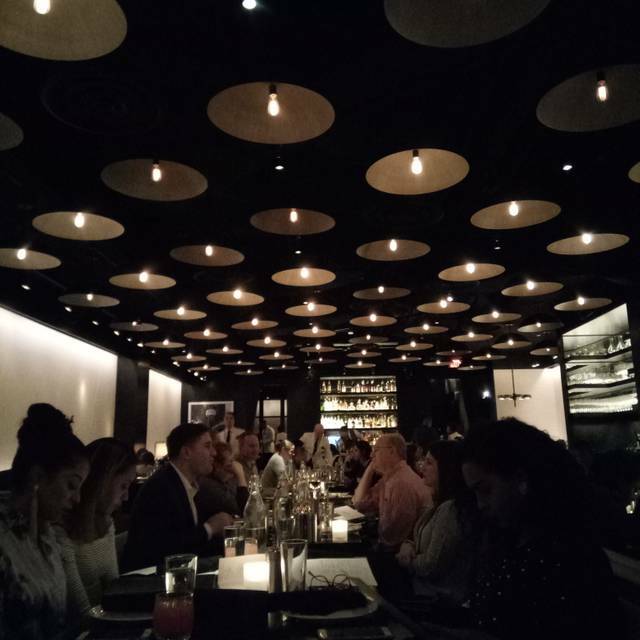 Service was spot on-attentive and professional but not obtrusive and the booth was conformable and quiet for a packed restaurant. It was expensive but so worth it! The Service was truly outstanding! I can not give enough praise about the food! It was amazing! We had the oysters, octopus, king crab pasta, short ribs and the brussel sprouts!! We will definitely be returning! !